Images are of actual installations - ©2019 Lake Geneva Blind Co.
Partners Kirsten Larsen and Scot Grunow bring 25 years of custom drapery and decorating experience paired with construction knowledge to provide custom blinds, shades, window treatments, upholstery and more to Southern WI and Northern IL. Design advice is complimentary. All website images are of our own work. We don’t use stock pictures! Bored with life as a banker, Kirsten ditched her suit for the world of decorating. After a fleeting turn as an antiquarian, founding Urban Frontier and a stint at the eponymous Atelier of Alessandra Branca, she learned the nuts and bolts of the craft working alongside renowned Chicago designer, Tom Stringer. She later took those skills heading up her own firm and workroom for many years on the North Shore of Chicago. 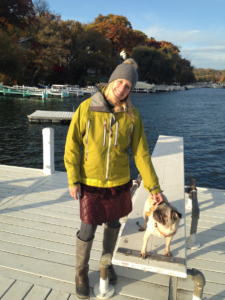 She returned to her native Fontana in 2014 after a 4 year residence in Switzerland with her husband, two teens and pug dog. Her personal motto is: Life should be lived in a relaxed luxury surrounded by the things that make you happy: family, food and soft pillows. 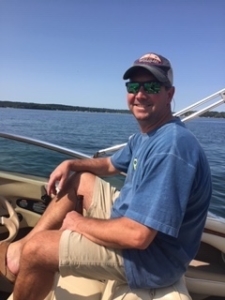 The Grunow family has facilitated fun for Lake Geneva locals and weekenders over the years whether tuning up your skis and grooming the slopes at Majestic Hills or servicing and launching your boat and water toys at Majestic Marine. Scot carries on the tradition as the current owner of the Owl Tavern on Black Point, serving up cool beverages and tasty treats from the smoker. Scot learned from an early age that customers enjoy having everything ready to go when they arrive at the lake! 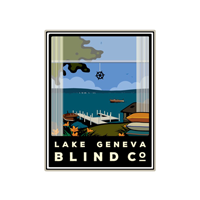 He brings that ethos to work every day at the Lake Geneva Blind Co. to ensure seamless installations and a hassle free experience.